If you are a Kiss fan, you know that September is a very busy month in the band's history. Or if you will, Kisstory. The band has released more records in the month of September than any other month, followed closely by October. The trend of releasing albums in September goes all the way back to the September 10th, 1975 release of the bands seminal career-launching double live album Alive! No question, if this album had not taken off, we would not be having this discussion today. The band's career was in serious jeopardy as their first three studio albums had been major duds in the sales department. Luckily for myself and Kiss fans around the world, Alive! became the bands first million seller and gave the band a second wind. During the 1980's the September releases for Kiss really kicked into high gear beginning with 1983's Lick It Up, released on September 18, 1983. Lick It Up was the band's first studio record to feature lead guitarist Vinnie Vincent who had replaced original Kiss guitarist Ace Frehley during the previous years Creatures of the Night Tour. Lick It Up also marked the first time the band had appeared on an album cover without their signature makeup. The official unmasking of Kiss happened on the same day of the album's release during a special appearance on MTV. Lick It Up was a solid record and brought the band back to platinum-selling status after the declining sales of their previous records, Unmasked and (Music From) The Elder. A world tour followed the release of Lick It Up, but by the time September of 1984 rolled around Kiss had another new record hitting the shelves. Animalize was released on September 13, 1984. Animalize pretty much continued were Lick It Up left off and Kiss once again had a million seller on their hands. The band had also ushered in another new lead guitarist for this record. Mark St. John replaced Vinnie Vincent for the recording of Animalize. Shortly after the albums release Mark would be replaced by Bruce Kulick due to an illness that affected Marks ability to play guitar. Another tour followed and by September 1985 Kiss returned to the record stores with Asylum. Released on September 16, 1985, Asylum became the third million seller in a row for Kiss. The band was definitely on a roll and for Kiss fans it was like Christmas every September. It's pretty amazing to think how quickly the band were delivering a new record. In today's market you are lucky to get a new record from your favorite band every five years and Kiss fans were getting a new record every year! After three consecutive September releases there was a two-year gap before Kiss delivered their next album. Crazy Nights was released on September 18, 1987 and although it seemed like a lifetime between records Crazy Nights proved to be another hit for the band and their fourth platinum record in a row. 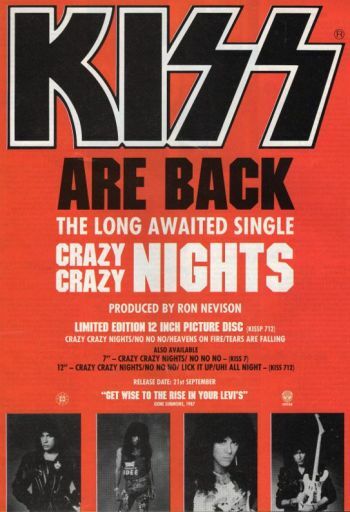 Crazy Nights was a much more polished affair than previous Kiss releases but the album spawned several MTV hits including the albums opening anthem "Crazy Crazy Nights." Kiss' next studio album Hot In The Shade arrived in mid-October of 1989 marking the end of their 1980's September juggernaut and also the string of platinum albums as well. Hot In The Shade only achieved Gold status. Kiss would not release another album during the month of September until 1998. Psycho Circus was released on September 22, 1998 and claimed to be a reunion of the four original members of Kiss. While the band had been on a highly successful reunion tour since June of 1996 when it came time to record a new studio record the band brought in several outside players to perform on the record and contributions from original drummer Peter Criss and guitarist Ace Frehley were very few. The album received lackluster responses from critics and fans but still managed to go gold. So there you have my round up of Kiss albums that were released during the month of September. A couple other items I will throw at you: Peter Criss released his first post-Kiss solo album Out Of Control in September of 1980 and Ace Frehley released his fourth post-Kiss solo album Anomaly on September 15, 2009. In Music Tags kiss, lick it up, animalize, asylum, solo albums, psycho circus, ace frehley, gene simmons, paul stanley, peter criss, alive!